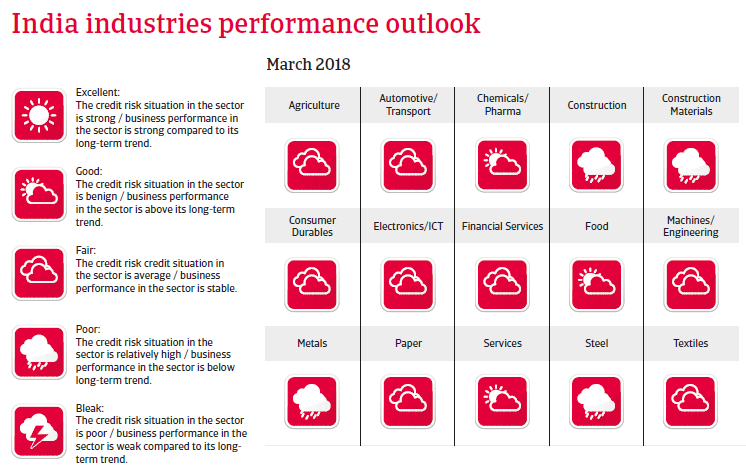 The economic growth outlook for 2018 remains robust, but a rather weak banking sector and high foreign indebtedness of domestic firms remain concerns. The National Democratic Alliance (NDA) coalition, led by Prime Minister Narendra Modi’s Bharatiya Janata Party, remains in a strong position, both as union government in New Delhi (where it holds an absolute majority in parliament) and in many larger states. The Modi administration has implemented several major reforms, improving the long-term prospects of the economy. It is expected that socio-economic issues and some tensions within the NDA coalition will not prevent the government from proceeding with reforms in the coming years. Currently it seems probable that the NDA coalition will secure a second five-year term in the 2019 general elections. India´s economy benefits from a stable political climate and a reform-oriented government. After growing 6.7% in 2017, real GDP is expected to increase 7.6% in 2018, mainly driven by government expenditures (up 15.4%) and private consumption (up 8.7%), while investments and exports are forecast to grow 5.9% and 3.9% respectively. 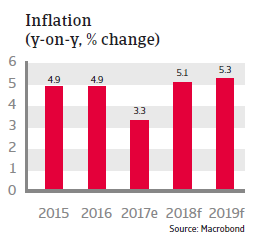 Inflation is forecast to increase 5.1% in 2018 following a 3.3% increase in 2017. This rate of growth, however, remains within the central bank’s target zone of 2%-6%. Fiscal consolidation does not show much progress, but the central government’s deficit of about 3% of GDP in the coming years remains manageable. 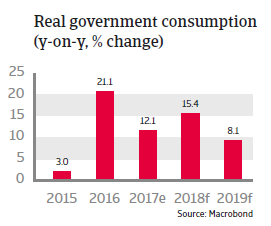 Government spending is rising due to subsidy programmes and infrastructure improvements (the government is investing in power infrastructure, one of the largest obstacles to India´s long-term economic growth potential). Revenues have also been increasing, sustained by higher tax income and robust growth. Public debt as a percentage of GDP (50% of GDP in 2017) is expected to fall gradually and to remain sustainable. It can be widely financed by domestic borrowing and its maturity is long, which mitigates negative effects. India´s external position is comfortable and the country and sovereign risks remain low. Foreign debt amounted to only 19% of GDP in 2017. The liquidity situation is comfortable with more than eight months of import cover. 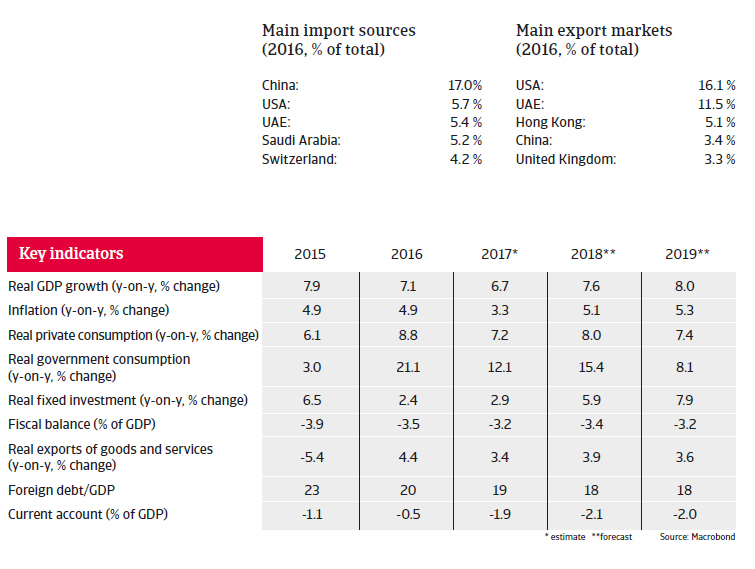 The current account deficit increased again in 2017 and is expected to remain at a level of about 2% of GDP in 2018 due to rising imports of both consumer and capital goods. Structurally high foreign direct investment and (more volatile) portfolio inflows are high enough to cover the current account deficit and to keep external debt levels low, rendering debt resilient to exogenous shocks. India has an excellent payment record, with no missed payments since 1970, providing it good access to capital markets. The rupee is expected to depreciate moderately in 2018 (after a relatively strong performance against the USD in 2017), because of the current account deficit, relatively high inflation and monetary policy tightening in the US. The quality of the Indian business environment remains relatively poor due to many structural deficiencies: an underdeveloped agricultural sector, poor infrastructure, inflexible labour laws, excessive bureaucracy, rigid land laws, and a shortage of skilled labour due to the poor education of most of the population. However, the Modi administration has taken steps to improve the business environment, namely a currency exchange initiative introduced in late 2016 and the introduction of a country-wide Goods and Services Tax (GST) in July 2019. 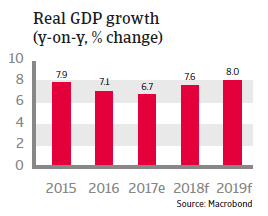 While both reforms initially had a negative impact on economic growth in 2017, they will help to push the economic growth rate to a higher level in the coming years. The currency exchange initiative (in which currency notes were replaced with new series) provides the long-term benefits of enabling the formal economy to grow at the expense of the informal one and increasing tax income. The uniform GST system will create a single national market and enhance the efficiency of domestic trade. That said, reforms in land and labour markets will proceed only gradually at the national level, given strong political opposition from civil society organisations and labour unions. 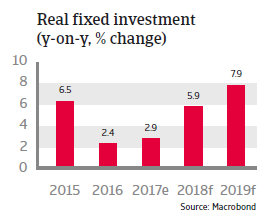 While India’s economy is expected to maintain its high growth rates in the coming years, private sector investments have decreased in the past few years due to low credit growth from the banking sector and high foreign indebtedness of domestic firms. High levels of non-performing assets at public sector banks are weighing on balance sheets. While recently announced steps to recapitalise India’s state-controlled banks will be supportive for credit growth and stimulate investments, high corporate debt remains a risk for the Indian economy for the time being, and further deterioration of corporates’ and public banks’ balance sheets cannot be ruled out. To a far greater extent than in other emerging economies, expected losses from non-performing loans and current debt-at-risk is eclipsing bank loan loss reserves in India.